This is relatively old news now, but I quit Google Plus (G+ from here on in). My reasons were relatively simple, and yet not at the same time. I had planned to write this post when I quit, but stuff happened and I didn’t. Stilgherrian’s piece at ABC’s The Drum today reminded me of why I was going to write, and effectively summed up what I was going to say, but I’ll lay out my reasons nonetheless. For the past few weeks, the gym has become increasingly harder. Cardio (the rowing machine) has left me gasping for breath, and I’ve had to stop so I could breathe as I felt I wasn’t getting enough oxygen (no narrowing of vision though, just a sensation). I’ve been waking up more tired and almost falling asleep at work. I feel that no matter what I do I’m putting on extra weight. I look at the stairs at work and my body flatly tells me that climbing them is a VERY bad idea. Today when I was folding the washing and then making the bed, I was breathing heavily and sweating. I’m vague and forgetting things that normally I’d have no trouble in remembering. I know I am actually really tired. I’ve had a very stressful month[s], I’ve not gotten all the sleep I should or need, and I worked for part of my weekend at Sexpo, as well as organising most of it, instead of resting. I hope that it’s just stress and exhaustion. I hope it’s nothing more serious, though sleep apnoea is also on the cards. The worst thing is that right now I’m very unhappy with me, this is not how I normally feel. I know that my energy levels are up and down generally, but making the bed has never been an effort for me before. I also feel that I can’t do much about it right now because I’ve just become permanent at my lovely global multinational, and I don’t want to stuff that up. So… I’ll make a GP appointment for Wednesday or Friday night and see what can be done. I know it might be as simple as low iron, slight asthma (worst asthma season in Melbourne for years), sleep apnoea, or stress. I’d like to know how to fix it, so I feel more like me again. I do, it must be said, take my body for granted. I live far more in my head than in my skin, perhaps part of being such a verbal thinker, that I don’t always notice my body until something goes wrong. I’m incredibly grateful that it gets me from A to B, is getting stronger and fitter as I go to the gym, looks good in clothes (so I’ve been told) and carries my brain around. Mostly though, it’s an afterthought. I don’t personally consider myself attractive, though apparently I am, just because that really doesn’t matter to my image of me too much most of the time. I am fat, and that sometimes bothers me, but mostly because my body is telling me about it through mild sleep apnoea, foot cramping (now fixed with orthotics), a small range of other mild annoyances. I’d like to lose the 10 kgs I’ve put on this year through illness and starting a new job, and I will in time, and then my body will be happier with me. I cut my finger badly on Saturday night while cooking dinner and every time I injure myself I’m brought back into my body and what it does, how it works and how I use it. I discover that I use bits of my body that I don’t think about in ways that I never considered before. I didn’t realise until Saturday night how much I use the side of my fingers, or how they are used as I move through the world. I do love my hands, I suppose I spend more time admiring them than other parts of my body, but then again I do have a thing for hands. And eyes… and I certainly love my eyes. I will stare quite happily at them in a mirror for minutes at a time, provided I’m not caught doing so. I like to touch things and feel them against my skin (well some things), and I’m currently intrigued with my body being as hairy as it is right now for the first time since puberty, as I’ve stopped waxing while dealing with a case of recurring hives (and wanting less triggers for itches than I already have), and feeling the wind interacting with my leg hair is certainly a sensation I’d completely forgotten. I do have self image crises from time to time, worry that I’m not attractive enough (whatever that really means – I’m not even sure now – but its a crisis when it happens), or that I’m not able to fit into that corset I bought 4 years ago when I weighed less. Generally though I’ve reached a point where I know that this is the only body I’m going to have and that I should start appreciating it and stop hating it (I reached that about 5 years ago). I’m at that point where if someone else has a problem with the way I look or am shaped, then that’s their problem and certainly not mine. It’s made my life easier, but also means that since I’m not stressing about how I look or what others think, that I tend not stress or think about my body very much – which may or may not be a good thing. I dress professionally (though usually comfortably) for work, comfortably and whatever works for home, and when I go out, if I feel like dressing up I do, but if I don’t, then I don’t. I have a small request. If I ask you to not refer to me by a particular name, then don’t. I don’t care if you think it’s funny or cute or sounds interesting, if I ask you to stop using it in relation to me, just do. To not do so, indicates that you don’t respect my wishes and think that your fun, desires, whatever are more important than mine. I know that it can seem trivial, but there are lots of good reasons why people don’t want to be known by particular names or labels, or want to be known by particular names and labels and it is not your place to judge their desires, and ignoring them suggests that your desire to label them or to call them something is far more important, regardless of the reasons why they don’t want you to. It is not your place to judge the validity of the reasons why someone refuses a label or name. It should be enough that I can say, “Do not call me X”, without also having to provide a reason behind that. And if I do provide a reason, listen to that reason and respect it, no matter how irrelevant you find it. Because it matters to me, if you respect me then it should matter to you. Yes, my reasons for not liking the name “Becky” may seem trivial, but I hate that name being applied to me and have threatened violence upon people who have called me that name, unknowingly or otherwise. So when I ask you to not use that name, just don’t. Because when you do, I know that you really don’t respect my wishes about how I want to be known. My girlfriend [not pictured] has this T-shirt and I wish I had seen it first so I could have it. 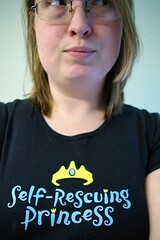 I love the message it proclaims, that I do not need rescuing, even if I am a princess, I’m managing quite well thank you. You see, I don’t want to be rescued. I’m quite happy doing my thing, enjoying my life and learning as I go. I don’t need to be saved from [insert thing here] by someone who believes that I do – because that just denies my agency, my choice, my experience and my desires. Far too often people act on their opinions about other people’s behaviour/appearance/beliefs/actions stating what someone “should” do, concern trolling or intervening directly in whatever they see is an issue. There is a difference between asking if someone is ok and dictating a solution (which is most likely unwanted), or directly intervening in something which the observer considers an issue, but the individual concerned does not. When you have been exposed to a culture which regards you as a publicly tradeable commodity, exercising control and autonomy become especially paramount. Being able to make decisions for yourself and your own body without the approval or consent of others is part of taking control of yourself and your identity. Thus, when people in these groups are informed that they must do something, it comes from a very entrenched culture of ownership. The person speaking often has privilege, and is exercising that privilege thoughtlessly. Many people claim to be well meaning, say that they just want people to be informed, but this presupposes that people are not informed on their own and that, moreover, it is only possible to reach one informed choice. Having things you “should” do sets you up for failure, because by the time you get around to “I should have…” you haven’t… and you therefore have permission to guilt trip yourself, or beat yourself up, or what ever works best… and that stems from our overly prescriptive society I believe. You “should” have done your homework before Sunday afternoon, you “should” have known not to get into a relationship with that individual, you “should” not have eaten that slice of cake, you “should” have gone to bed early, etc. When we were children we, well I did, had parents who got to decide things for us. They decided what we “should” do, what schools we went to, whether we believed in a god/s, what communities we were involved with, etc. As adults we were supposed to gain our independence and be able to make our own decisions about continued study, work, health, socialising, community involvement, etc. However, parents, friends, family and random strangers often decide to intervene in our decisions and tell us what we should and should not do, even though we’d rather they not. And like s.e. smith’s comment above, the denial of agency comes from a very entrenched culture of ownership. So next time, before you go riding in to rescue or save someone, find out if they want it. Next time, before you tell someone what they should do, consider how you feel when you are told what to do by someone else. Next time, before you pass judgement on someone, think about how that will make them feel. This does not stop you having opinions about things, because that is close to impossible, but try and think about your opinions and how healthy they are for you and those around you. I can think all I like about how I believe that X should never have entered a relationship with Y, or how some of Z’s problems would be solved if ou got a new job. But for me to tell them that, that’s hardly fair or reasonable. It does not take into account elements of their situation that I cannot know, it tells them that I believe that my opinion of their situation is more important than their own (otherwise why would I dictate something to someone?) and that I believe that I am superior to them (otherwise I would not be dictating to them). Of course, since I’m referring to adults and not children, none of this is true – and is rarely true for most children either. Again, to tell someone what they should do demonstrates that I do not trust their own judgement and ability to decide on a course of action. I do not need saving, I do not need a knight in dented and rusty armour, I do not need to be told how to improve myself. I will ask for help if I need it and otherwise will continue along my own way, learning, having fun and doing it my way.